I’m so excited to finally be able to share this with the Lotus community. In the spirit of adding lightness, I’ve spent the winter working closely with Millionaire Racing to create a completely bespoke titanium dual exhaust exhaust for the Lotus Elise. This exhaust is currently 1:1, but we always considered it a prototype for a limited run. I’d love to be the only one to have one of these, but it’s so good that they should be on more cars. 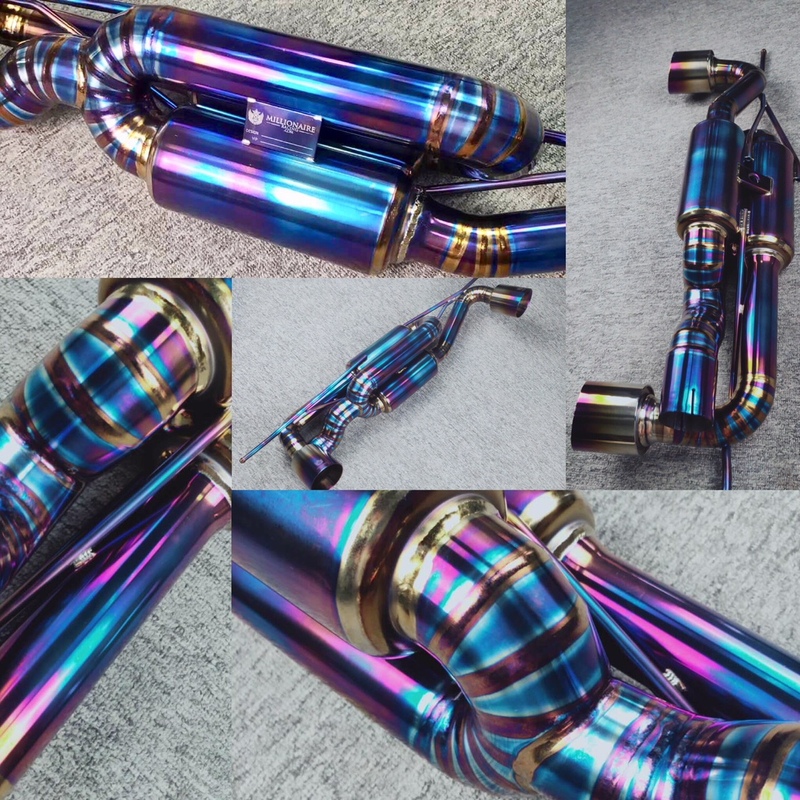 The owner of Millionaire Racing has been in aftermarket performance realm for Japanese vehicles for years and he’s been creating titanium exhaust systems under the Millionaire Racing brand for Lamborghinis, Ferraris, Aston Martins, etc for a while. He knows this world well and it’s his connections that made happen. Huge thanks to him. I had a couple of very specific requests, but the main ones were that it be bolt-in and that it look beautiful when running the rear panel delete or Euro panel. I’m going to run naked for a while with Greg’s Race Parts panel delete kit. It was installed today, so there are more pics and videos to come. Wait until you hear it. It sounds amazing. shay2nak, jlj3394, Mad MaTTer and 3 others like this. Last edited by addliteness; 04-16-2019 at 02:18 PM. Reason: Correction for weight. Should I start the group by list? Why dual with a naked rear? A single would be even lighter. I'm assuming it isn't repackable, and at that weight I have to ask, does it even have muffler packing? I'm guessing "amazing" and under 5 pounds = loud, but I'm sure you'll post a sound clip. Some of the decisions were driven by what I was looking for and others by what was already on the market. I like the Euro-look and likely will re-install my Euro panel later in the season. I’m running naked to start with, so I can show a few people how it turned out without having to pull the back end apart. It certainly could have been lighter with a single, but another vendor already does a single titanium exhaust, so that seemed redundant. You’re right, it is on the louder side, so maybe not for everyone. It makes some great pops as you come off the gas. This part is tough to quantify, but it the car feels more responsive than before as my previous dual exit was not really designed for my BOE supercharged car. I will follow- up tomorrow with some videos and more pics. I’m happy to answer any other questions. You’re right, it is on the louder side, so maybe not for everyone. It makes some great pops as you come off the gas. This part is tough to quantity, but it the car feels more responsive than before as my previous dual exit was not really designed for my BOE supercharged car. Thanks for answering. Definitely a unique exhuast. How is the drone at various rpms? I don't mind loud(but not muffler bypass loud), but drone is an absolute deal breaker for me. I might be interested if the price is right. @Varun916 I probably need a bit more time with it to give you a real assessment. At highway speeds in 6th it seemed fine. Maybe a bit more than my Larini at lower constant speeds. Just drove my car to BOE for my rev400 install with dual straight pipes and need to tone it down. This seems perfect. Looking forward to the sound clips. Last edited by Brandonm84; 04-14-2019 at 07:16 AM. I was running the Larini and my car is supercharged. Not ideal, I know. This immediately feels more responsive, freer revving, but I'll admit that's pure seat of the pants. I don't how one would measure that. Addliteness, thank you for sharing this new product with the community. This give us owners more choices. I assume this would also fit the 06 NA Exige. So I’m also interested but need to know how much this will cost. I think the single tip would not look as beautiful and elegant as this one. Wow! Looking forward to installed pics and sound clip. How much would be the cost for this if we had a group buy? And is this for NA or supercharged setup? Definitely interested. Thanks for sharing. Last edited by NoRawkus305; 04-13-2019 at 11:47 PM. My car is supercharged, so that's what I intended it for. I was running a Larini previously, even though that is not advised. I'm not an expert, but it's my understanding that one of the limitations with other exhausts and supercharging is the impact on muffler packing from the extra heat produced by supercharging on exhaust gas. Basically, the life of the muffler is shortened especially if the car is tracked. I don't think that will be an issue here as these are more resonator style. This is a cold start right after installation. Sorry for the background noise. It's raining here today, so I'll probably have to wait until next weekend to shoot more. That looks and sounds great! Really dig the "rainbow effect". Curious about your statement on the your previous Larini not being ideal for your SC. I have been running their Clubsport single tip above diffuser exhaust (and decat) for years and no issues. It was touted as being a good exhaust for SCed cars or are you just speaking to the twin tip Larini? Before installation. Comparison with stock exhaust.